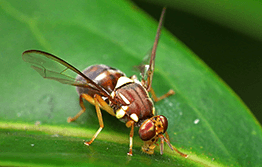 Queensland fruit fly (Qfly) is widely recognised as one of the world’s worst economic pests of fruit. Apart from lowering production and making fruit inedible, it has severe effects on trade to sensitive local and international markets. Adult Qfly are about 7mm long and brownish in colour, with distinctive yellow markings. Females lay their eggs into soft and ripening host fruit. Larvae (maggots – up to 10mm long) emerge from the eggs and cause damage by living and feeding within the fruit, which may appear intact from the outside. It’s found in Northern Territory, Queensland, New South Wales and Victoria. If you think you’ve seen Queensland fruit fly any where else in Australia, call 1800 084 881. Qfly are spread by the movement of uncertified host fruit out of infested areas. 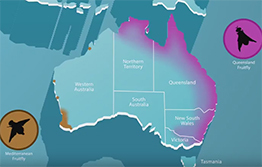 A number of management zones have been established to protect horticultural production areas from Qfly.